Rima: Our trip to the art gallery. Have you ever seen sculptures, furniture and art? 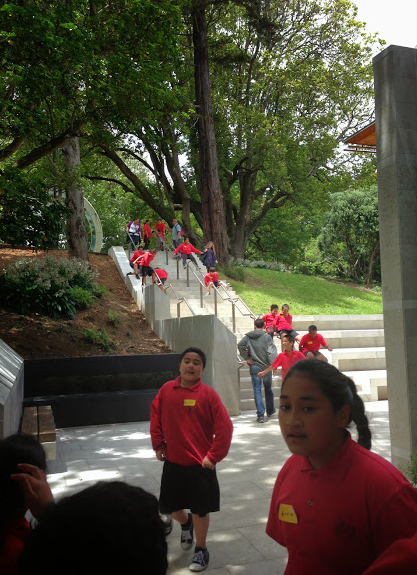 Well the year fives from Pt England school had a chance to visit the Ackland art gallery. When we reached the art gallery we had some wonderful people waiting for us. Then they introduce themselves and told us there names, it was Charlotte, Linda and Mandy. When the clock stricted to ten the doors opened wide. Afterwards we started exploring. The first room we went to was called the victorian art. Inside the victorian art Linda informed us what we had to do. We had to admire a picture called the The Fortune Teller and explain what was happening in the picture. After that we had to draw what happens next. My story was that when the girl is about to get married there was this form that slips out of the man's pocket and when she reads it she finds out the truth and then it was of with his head. Soon after we visited another room. So then we admired another art it had a lot of colors. Linda explained us what we had to do. She said that each colour represents something so we had to find out what it represents. She also gave us some clues for example she gently tapped the ground with her fingers and then we had to found out what the sound sounded like. Later that time we went outside for morning tea. Morning tea was great but the awful part was that we had to walk on so much stairs it was terrifying! After we finished our lunch we had nothing to play on suddenly we had some kids from class ten and nine using the stairs as slides it was awesome. Later the parent helpers got their chance to take us exploring the art gallery. The first room we went to was the lego room. We made so much crafts and we also got to go to the learning center that is where we got to play with the toys. Maybe next time you might get a chance to go to the art gallery. If you do I hope you have fun exploring art. This is an image if the stair slides.